Zoeva Rose Gold Eye Brush Set. For ages I have been on the hunt for a set of god quality eye make up brushes and a lot of the ones I have come across did not have the brushes what I was looking for and then I stumbled upon the brand Zoeva which so many you tubers and bloggers have raved about. So after I looked at so many reviews on the brushes I decided to go ahead and purchase them. 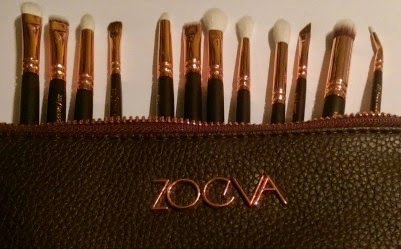 The brushes come in a lovely brown clutch classy clutch with rose gold detailing on the zip and also has the Zoeva brand in Rose gold aswell which I think Is perfect for storing make up brushes in while travelling so the brushes do not get damaged. The set contains 12 eye brushes. The brushes that come in the set is all you could wish for as each brush can be used for a different purpose when it comes to applying eye shadows, eye liner or even brow products. The brushes are so worth the money as they are so lovely and soft and to be honest so well made, the rose gold detailing on the brush and the rose gold ferrule makes the brushes look a lot more expensive than they are.